Statistics indicate that up to one-third of all adults live with lactose intolerance. These people lack or do not have sufficient quantities of the lactase enzyme in their stomach that makes it possible to break down the sugar known as lactose, which is found in milk and other dairy products. Without the enzyme, consuming dairy products causes abdominal discomfort, bloating, gas and diarrhea. However, there are many alternative dairy-free treats hourly Oshkosh caregivers can prepare to help satisfy their loved one’s sweet tooth. This frozen treat is made using sweetened water and fruit juice or other flavor additives instead of milk or cream. Sorbet comes in many different fruit flavors and even chocolate. 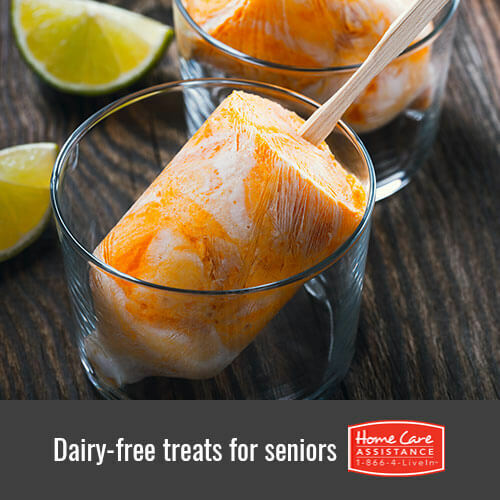 This dessert option also does not contain fat, which is great for seniors on a diet. Manufactured by a company called Luna and Larry’s, these delicious non-dairy treats are made with coconut milk rather than dairy. The organic ice creams come in a wide variety of flavors to suit your loved one’s preferences. These non-dairy ice cream sandwiches come in berry, chocolate, cookies ‘n cream, mint chocolate chip, vanilla and totally vanilla flavors. The best part about these frozen delicacies is that they are made using soy. So Delicious is another company that makes special dairy-free ice creams using coconut milk. They also manufacture dairy-free yogurt, dessert toppings and beverages in case ice cream isn’t on your loved one’s mind. A favorite with many for generations, the sweet, creamy filling of this popular cookie is made with canola oil and corn syrup. Instead of using milk and cocoa to make the chocolate cookie, Nabisco uses cocoa and alkali. When craving something crunchy and peanut butter flavored, these cookies are sure to do the trick. They are made using a variety of oils rather than milk, however, the label warns that the product is made using wheat, peanuts and soy. While this is dairy free, this isn’t a treat for those with a nut allergy. The traditional sweet crackers come in a variety of flavors and are all made using some type of vegetable oil. Eat them alone, with peanut butter or with marshmallow cream and ready-made frosting, which are also dairy-free sweets. Dietary restrictions make mealtime challenging for seniors, but there are numerous at-home care agencies in Oshkosh that can help your loved one maintain a nutritious diet. Contact Home Care Assistance of Oshkosh at (920) 710-2273 to speak to a dedicated Care Manager about our premier services that enable seniors to age in place comfortably. Our trusted caregivers are always available to help our clients adopt healthy habits that promote longevity and wellbeing, including healthy diet and regular exercise. Be sure to schedule a complimentary consultation today.